I really want this to work…I really do. I love cheap fares, I love your plush leather seats, I love your fairly quick check in process, and I really LOVE your DirectTV in every seat, but you’re making this really hard. First you completely cancelled my trip to Columbus a few weeks ago after your meltdown. Now this..
About 10am this morning you sent me an email letting me know that due to some sort of scheduling conflict the plane scheduled to take me to Columbus tonight was no longer available, BUT you had arranged for another plane, which would not have plush leather seats or TV’s, but it would get me there. As a nice gesture you gave me a Jetblue credit of $25. Nice move. 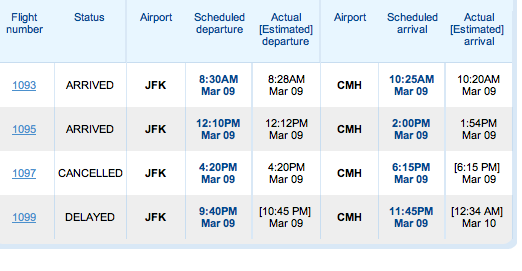 So when I arrive to the airport for my 9:40 flight you treated me again…20 minute delay. Ok, so not the end of the world. Now it’s 10:20pm, and we’ve learned that the flight has been delayed due to “crew scheduling conflicts,” until AT LEAST 10:45 but we’ll have to wait for more updates. Annoying, and very troubling because it is a movie I’ve seen before. I have a feeling I may hear the words “cancelled” soon. Now I realize that airlines screw up a lot. Hey, it’s a complicated business, but you’ve now slammed me on back to back trips. Who knows, you may successfully ruin 2 trips in a row. And it’s becoming clear that despite your great fares, your plush leather seats, your fantastic live TV service, and your potentially $100’s of dollars in credits, that I may very well have to say goodbye to you. Hopefully someday you can get your act together, and we can fly together again, but until then I need an airline that can consistently get me to my destination on the DAY they said they would.